Since the beginning in 1983, The Treadmill has been deeply rooted in environment consciousness and promotes environmental advocacy thorough to presenting our guests with knew and exciting opportunities throughout the Peninsula & Big Sur. While our number one commitment is encouraging collective participation, exploration and inspiring a healthy lifestyle for individuals and families, participant’s safety is always been paramount to our events. We know you love getting out on the trail as much as we do, but how often do we think about all of the work that goes into building and maintaining the trails we know and love? That’s why this National Trails Day, The Treadmill invites you to join us to come RUN & HIKE and help leave the trails of Garland Regional Park better than we found them. Together, with volunteers from around the country, you will be part of a nationwide pledge to improve 2,802miles of trails. After National Trails Day, as a thank you from us, anyone who improved a section of trail (of any length) will be entered to win a $200 gift certificate to The Treadmill. As well, anyone who pledges can go to americanhiking.org to enter to win the nationwide grand prize, which includes swag and premium outdoor gear from the American Hiking Society. The Treadmill will be provide everyone with bags & gloves. Anyone who wishes to join The Treadmill in this pledge, please bring your friends & family and meet us outside the Visitor’s Center at 8am for what promises to be a special day. Rachael Elizabeth Short, an accomplished photographer and gallery owner, was severely injured in a car accident on November 1, 2010. 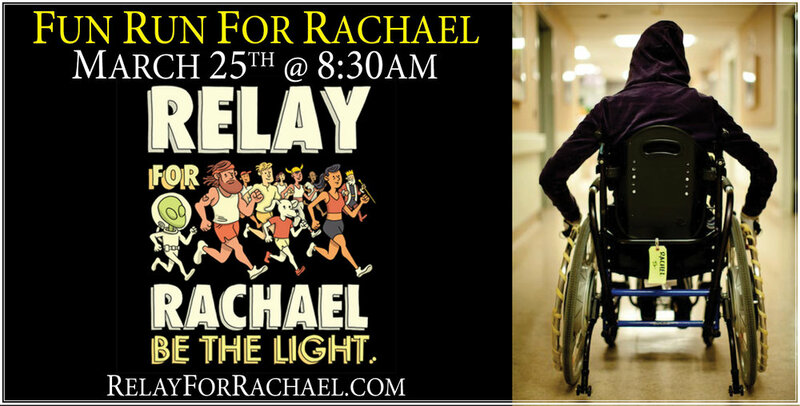 Relay for Rachael is an annual fundraising event that's made up of a group of Rachael's friends who take on the famed Big Sur International Marathon in an effort to raise money to help with ongoing caregiving and physical therapy costs for Rachael. Over 7 years into this journey, Rachael has made huge strides towards recovery. Constant rehabilitation consumes the majority of her days, exercising 6 days a weeks, 4-6 hours a day. Rehab is the most important to Rachael, which requires an immense amount of resources. Supporting her in this endeavor is The Treadmill's goal. The Treadmill is going to be hosting a guided hike at Brazil Ranch on January 31st to help the effort. You're attendance will add $1 towards REI's pledge, as well The Treadmill's also pledging to donate $2 to local conservation efforts through the Big Sur Land Trust & the Ventana Wilderness Alliance for every person who joins us on January 31st. Grab you hiking poles, headlamps, cameras and warm clothes and join us for an adventurous, challenging and unforgettable hike on the Big Sur Coastline. The Treadmill's Grand Reopening Fun Run & Hike marks the first Fun Run & Hike at the newly renovated Treadmill. We'll be celebrating by crowning the 2017 Palo Corona Climb Champion, 2XU will be joining us with free compression to try and they will also be raffling away 2 pairs of 2XU compression tights. We'll also be enjoying a little Skratch Labs nutrition & hydration, serving FREE coffee from Carmel Valley Coffee Roasting Co. and serving a little breakfast magic from our favorite Ultra Running Chef & the 2013 Food & Wine Magazine's "Best New Chef" Justin Cogley. Not enough ? Didn't think so !! We'll also be raffling away a FREE entry into the Jingle Bell Run Pacific Grove on December 9th, and we're extremely proud to announce that The Treadmill girls are back with their "Name Your Price" benefit shop where 100% of your purchase will go directly to Dorothy's Place in Salinas !! If you're running or walking in the Monterey Bay Half Marathon, be sure to join The Treadmill, ASICS, GU Energy Labs on Saturday morning for our "Shakeout Run with The Treadmill Pace Team"
ASICS will be brining demo shoes & The Treadmill will be giving away a pair of NEW ASICS Shoes to one of our lucky guest !! The Treadmill family is thrilled to announce that starting on October 2nd, our 34 year old retail location will be undergoing a major face lift. We’re very excited about the next phase of The Treadmill’s journey, and are focused on making our little family’s store better than ever. During our 2-week renovation, we will have a temporary location only a few hundred feet from The Treadmill’s front door to continue serving the active & style conscious community on the Monterey Peninsula. We invite you to join us at our Renovation Fun Run on Saturday, September 16th @ 8am to celebrate the future and wish the old shop good bye. We’ll have amazing deals on shoes, clothes and all canvas prints will be 30% OFF !! We will also be giving away TWO pairs of tickets to The Ventana Wilderness Alliance’s VWA presents the Wild & Scenic Film Festival on Saturday, September 23rd. Calling all trail runners of all abilities! The Treadmill's "How to Trail Run Workshop" presented by Salomon Running with 100% of the proceeds benefiting the Big Sur Land Trust. Did you ever notice that MOM spelt upside down is WOW? Join The Treadmill & friends on Saturday May 13th at our annual Mothers Day Fun Run and help us spoil the mom’s in our lives with a fun morning inside Palo Corona Regional Park. If you're running or walking in any of the Big Sur International Marathon's 2017 events, be sure to join The Treadmill, ASICS, GU Energy Labs & 4 time Big Sur Marathon Winner Adam Roach on Saturday morning for our "Shakeout Run with The Champ"
ASICS will be brining demo shoes & gifts and GU Energy Labs is brining their AMAZING GU Stroopwafels !! And The Treadmill will be giving away a pair of NEW ASICS Shoes to one of our lucky guest !! The thrill of coming home has never changed, and we want you to join in on the fun on Saturday March 11th, as we come home to crown the 2016 Male & Female Palo Corona Climb Challenge Winners. This is a completely FREE event. We will leave from The Treadmill at 8am. We ALWAYS make the first “HOME RUN” of the year a fun one, so be sure to mark your calendars!! Join The Treadmill on Saturday, February 18th for another Fun Run & Walk along the crashing shore of Scenic Rd in Carmel-By-The-Sea. Maps and multiple route options and descriptions will be posted, so please click "GOING" to stay informed and up to date on important information. We will leave the from the parking lot at the bottom of Ocean Ave. in Carmel-By-The-Sea. Join The Treadmill on Saturday, January 21st for another Fun Run/Hike experience throught the romantic hills of Fort Ord. We'll also be giving away TWO FREE RACE ENTRIES into Inside TrailRacing's Fort Ord Trail Run on February 4th. We will leave the from Badger Hills Parking Lot (west end off highway 68) at 8am. The last Palo Corona Fun Run of 2016 doesn't come without a few fun bonuses. Our 2nd Annual Ugly Swerater Fun Run & Santa Selfie Challenge Run is a Tribe favorite and completely FREE. Find our little Santa Gnome, take a selfie with him, post it on The Treadmill's Facebook Page and you'll be entered to win a $100 Gift Certificate to put under the tree for you or someone else. Winner will be announced Sunday morning. Don't forget to tag yourself so we can track you down when you win !! We'll have coffee from Carmel Valley Coffee Roasting Co. and some treats for you after. Family and strollers VERY VERY Welcome !! On Small Business Saturday, the small Treadmill girls want to help kids " who don't have food and markers and stuff like that". The girls are hard at work making drawings that will be available to buy in order to raise money for Dorothy's Place Hospitality Center. Pictures will range from $2 - $5. It's a small impact in the big picture, but will serve as a huge lesson for the next generation of Cleary's and we hope that our friends will help us in growing their philanthropic hearts !! Bring your friends or come make some new ones with The Treadmill and Salomon Running as we tackle Palo Corona Regional Park and Inspiration Point. You'll have the opportunity to experience Salomon's technical and stylish running footwear, boasting unparalleled lightness, grip, protection and durability that Salomon Running Shoes are known for. Someone will also win a PAIR OF Salomon shoes. The Treadmill’s Pace Team is back and our team is FULL of FUN, ENTHUSIASTIC runners. 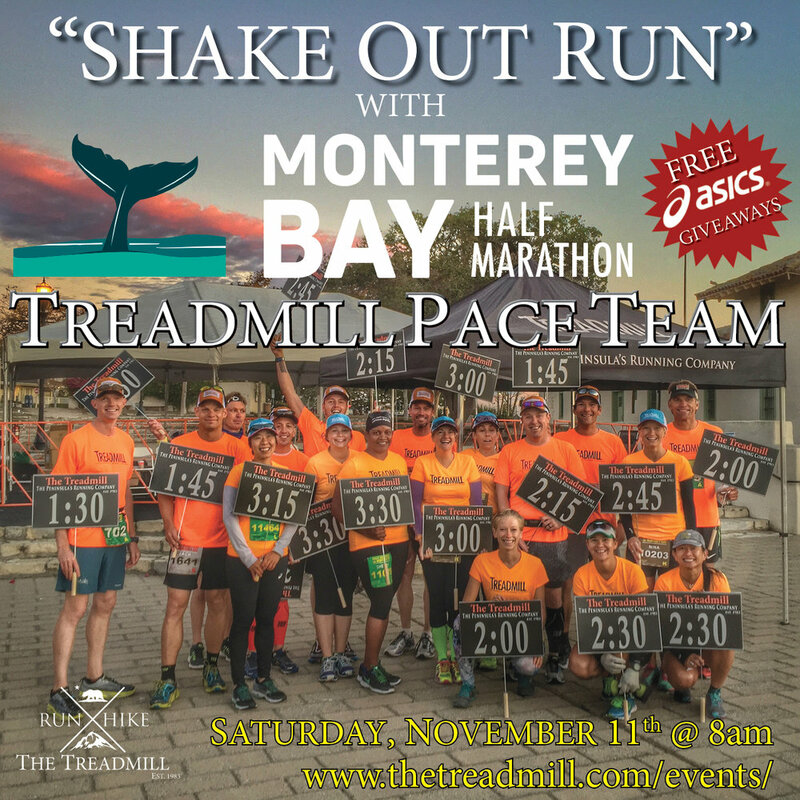 Come meet the Treadmill Pace Team on Saturday, November 12th at 8am outside the Big Sur half Marathon Expo near Fisherman's Wharf #2 in Monterey. 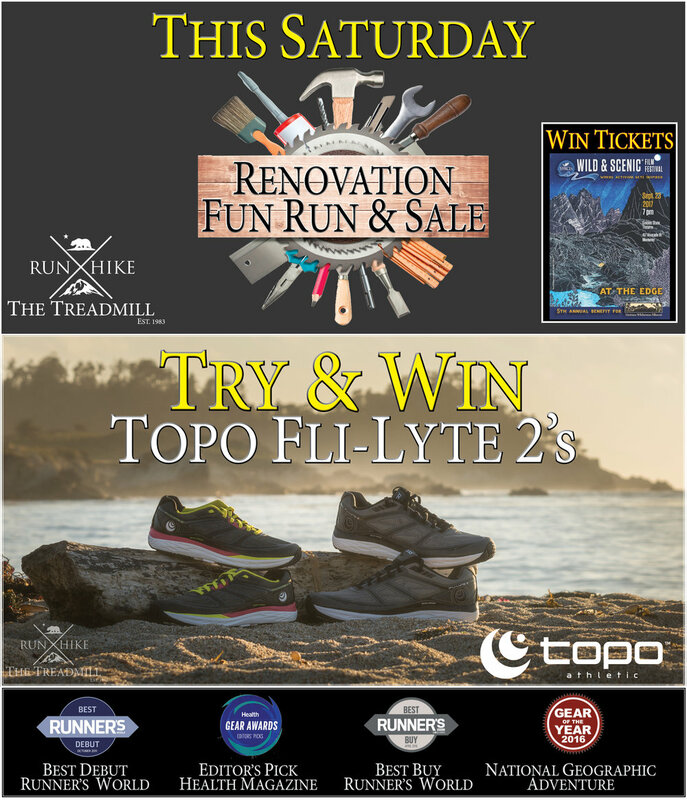 We have FREE giveaways as well as TWO pairs of ASICS Gel-Kayan's to give away !! If you're interested in following one of The Treadmill's pace groups, please CLICK BELOW, select your desired time and join our mailing list. Practice runs, Pace Team leader bios and prizes will be just some of the advantages of signing up. Garland Ranch Hike, Walk, Run & Photography Meet Up. We've missed our parks, we've missed our friends and we've missed the trails. We had a great morning at Garland Ranch Regional Park with old and new friends. It was great to be back out on the trails with friends and family....great morning. Great morning with The Treadmill Tribe. Thank you firefighters for saving Palo Corona Regional Park !!! We all thought of you when e got to Inspiration Point and could see the break lines you cut along some very treacherous terrain....WE LOVE YOU !! The annual Coastal Cleanup Day is the world’s largest volunteer effort for the ocean. Every year, hundreds of thousands of volunteers remove millions of pounds of trash from beaches across the globe. If there’s anything we’ve learnt from the Soberane’s fire, t's that the trails we use, the hills we hike, the mountains we climb, the beautiful colorful landscapes we take pictures of, aren’t guaranteed to us. Saturday Evening was a wonderful night to be small business owners. While the success of the event almost entirely falls onto the strength and kindness of our friends inside the community, one of our friends form outside the community played a large part of the charitable success of the event. Our most sincere THANK YOU goes out to the men and women of this world, who leave their families and their homes to risk their lives in order to protect our families, our homes and our lives. The members of the Mid Coast Fire Brigade and the Big Sur Volunteer Fire Brigade are indispensable foot soldiers and are essential to the safety and security of our community, and we want to thank you, our friends for helping us say thank you to them.